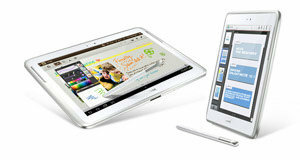 Samsung Galaxy Note GT-N8010 16GB Storage, Wi-Fi, 10.1" Display - White Android. 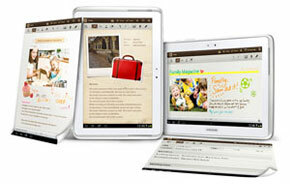 Enter a new world of entertainment and productivity with Samsung Note GT-N8010. With its exclusive features like Embedded-S-Pen, S Note, Learning and video hub it gives you an experience you never had before. Powered by 1.4GHz Quad Core processor it gives you optimum performance in every task. Increase your productivity with its multiscreen functionality which lets you simultaneously view and use multiple apps, browse the web and watch videos. With its wide 10.1-inch touchscreen you get all the space for more accuracy in your work. With its multi-screen support you get a PC like performance plus it lets you work uninterruptedly as you dont have to stop your work or entertainment for doing something more important. Experience more accuracy in sketching, taking notes and drawing with its incredible precision. Make your ideas come to life with this pressure sensitive [precise pen which writes and works exactly how you want it to. This intuitive device gives you a natural experience as if you are writing with a pen. The Bio Kelp speakers captures the true essence of eco-aware technology. Bio kelp speaker uses natural materials extracted from seaweed. It delivers better audio with more definition and clarity as compared to other conventional speakers. Sophisticated digital publishing has given you the freedom to choose and combine all kinds of multimedia content. You can select from the collection of templates and choose the one which best suits your requirements. The expertly designed templates cover all areas including Note, Meeting Note, Diary, Magazine, Ideas Note, Travel and Recipe. It lets you create professional documents with ease. With its shape match feature everyone is an artist. It converts your roughly drawn sketches into perfect lines and shapes. It recognizes what you are trying to draw and helps you it creating it efficiently. The formula match turns your mathematical formulas into neat text. It also lets you find graphs and other representations that further demonstrates your formula. 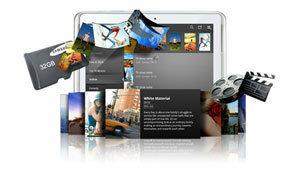 Create amazing artwork and edit your photos and images with Adobe Photoshop Touch. This incredible creation suite is ideal for making your pictures perfect by using blending, multiple filters, layers and much more. Enjoy your media and games to their highest extent with its spacious display. The large 10.1 inch display gives you all the space to have a better enjoyment of your favourite movies, programs and songs. It also lets you work more creatively and offers more productivity. With BD live (Profile 2.0) and Bonusview have more fun with Blu-ray. With Bonusview feature you can watch additional features in a second window while the movie is playing in another window. Take your interaction one step ahead with BD Live. It also allows you to connect to the Internet for accessing even more content related to the movie you are watching, hosted on servers by the Hollywood studios. Samsung Galaxy Note is equipped with high-powered 1.4GHz Quad Core processor and 2GB of RAM to ensure more enjoyment and better gaming experience. It lets you have a smooth multimedia playback and seamless web browsing. Featuring Android 4.0 Ice Cream Sandwich operating system gives you an altogether better user experience with faster navigation and easy usability. It offers improved performance in every task and gives you a new range of functionality. The huge 7000mAH battery gives you more enjoyment and more productivity even on the go. Enter a new world of entertainment without any delay with its Wi Fi. Wi-Fi Channel Bonding amplifies your data transmission rate and efficiently uses two channel bonding instead of one. With this technology it lets you access web-based content such as movie downloads, music files and games in half than the usual time. Get the most out of your tab with the especially designed apps. 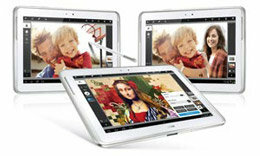 These apps lets you have full use of the intuitive S Pen and its splendid functionality. Find them easily using S suggests which recommends you the best apps. Moving on is not a problem anymore. With Easy Phone Sync you can easily transfer contacts, multimedia and messages from the previous device. It lets you switch from other brand to Samsung without any hassle. It gives you an easy connection with other devices. 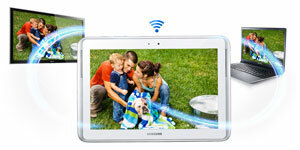 Get easy connection to tablets, laptops and TVs wirelessly to share multimedia and other important files. It also lets you easily watch your media in HD quality on bigger screen. Learning Hub offers study material for all kinds of people for every age group. It helps you in improving your knowledge, taking tests and plan your education schedule. So educate yourself with its learning hub. With video hub you can buy or rent movies. Select your favourite movie from the wide selection and enjoy it with your friends.